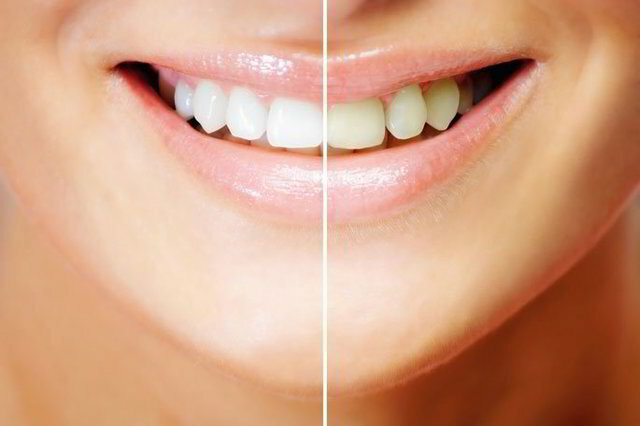 Teeth whitening or tooth bleaching is a cosmetic dentistry procedure designed to remove stains and discolouration, as well as lighten pigmentation within the teeth. The level of whiteness that can be achieved will depend on the level of discolouration of the teeth and how they came to be stained. Teeth that are brown or yellow due to coffee, tea, or smoking stains will generally lighten four to five shades. Teeth that are grey due to pigmentation within the teeth will lighten two to three shades. Teeth whitening can be done in one of two ways: in-office or at-home tooth whitening kits provided by a cosmetic dentist. Both of these methods are done under a cosmetic dentist’s supervision so that the chance of negative side effects is reduced. Teeth can often be whitened by the several new techniques of “bleaching” available today. The most common method used is the “in-office” methods where a strong bleaching agent is placed over the isolated teeth and a special light is used to assist the bleaching material lighten the teeth. This method is generally more controlled and probably better for people who have tetracycline stains or streaks on their teeth. The “home” techniques involve making trays which fit into the mouth and these are then filled with bleaching materials. When worn for a few minutes a day, noticeable result is seen generally within a few days to a couple weeks. Results vary from individual, your dentist will be happy to help you decide which method works best for you. Some of the factors involved include the intensity of the stains, whether or not you have fillings or crowns on your front teeth as well as what may have caused the stains.